Why? Which barriers do EU mobile citizens face to exercise their political rights? What initiatives have been developed to tackle the issue? 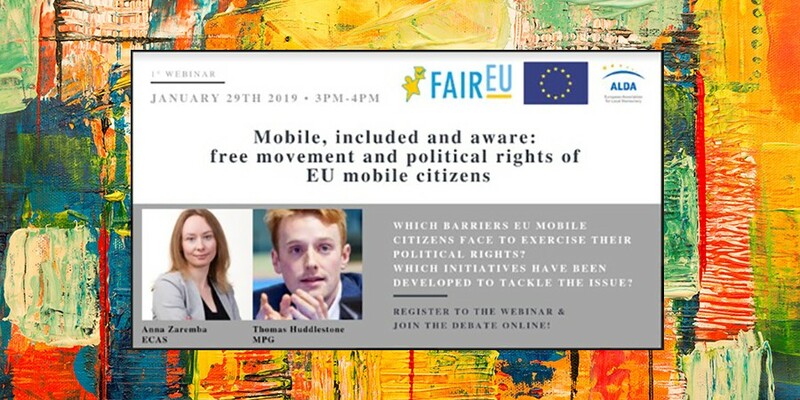 In efforts to shed light on this challenge and to encourage solution-orientated discussions, the European Association for Local Democracies (ALDA) has developed a series of webinars in the framework of the FairEU project, aiming at fostering the successful inclusion of EU mobile citizens in their host EU country’s civic and political life. A participatory-oriented approach, within the limits of online webinar technology, characterizes the webinars. Participants will have the possibility to make live questions and observations, provide feedback that will be integrated in the following webinars and propose the topic for the last webinar. The first webinar of the series will take place on January 29th. With their stories and experiences, Anna Zaremba, EU Rights Coordinator at the European Citizen Action Service (ECAS), and Thomas Huddlestone, leader of VoteBrussels campaign and research director at the Migration Policy Group, will lead the participants to explore the trends, barriers and initiatives of EU citizens that live in an EU country different from their original one (click here to register).